Dream Kitchen, Boat Parking, Spa, Pool Table, and 5 Minutes to the Lake! Step inside this lovely single story newly remodeled home and see the care and details the owners have used to create a retreat for your comfort. Enjoy the vaulted ceilings with rich wood cabinetry, wood flooring and mountain antique decor as well as the added amenities of an outdoor spa, 6 foot pool table, fenced in yard and a kitchen to make you drool! From the new deck out front, enjoy the view of the wooded acreage and pond across the street which was home to the old trout farm in the Fox Farm area. This dream cabin is only five minutes from Bear Mountain and Snow Summit, and only two minutes from nearby shopping and restaurants. The inviting, warm, living room has wood burning fireplace and flat screen TV, DVD player and WiFi. For your entertainment, 6 foot pool table rolls out to allow easy access when it’s time to cue up. The spacious kitchen is an Iron Chef’s dream! New stainless appliances including 2 ovens, large microwave, dishwasher and trash compacter adorn this gem. The owners have lovingly outfitted the kitchen with all your cooking needs in mind. Cooking lessons anyone? Adjacent to the kitchen is a lovely dining area and comfy couch to enjoy the aromas cooking up with finely crafted hand sewn decor items to add to the warmth and ambiance of this amazing room. The master bedroom has a luxurious queen and nicely updated private bath with a shower. Guest room one has a comfy queen and guest two has a double bed with a single trundle for added sleeping for the kids. New electric blankets have been provided for each bed to keep you warm and cozy for a good winter’s night sleep. The two guest rooms share another updated full bath with a shower/tub combo. The large spa out back is for your enjoyment and you won’t worry about the kids playing out back in the fenced in backyard. A charcoal BBQ is provided for the grill chef. Parking for 3 cars plus with plenty of room for boat parking during the warmer months. Garage is locked off for owner’s use. Come on up and enjoy this lovely retreat and let your cares slip away! View more photos, check availability and book Catalina Retreat online at RSVacations.net today and treat yourself to an amazing Big Bear Lake Vacation. Thank you so much for allowing us to stay in your rental, it was the perfect size and absolutely beautiful!! I personally fell in looove with the kitchen! This was a very special weekend for us as one of our best friends joins the Navy next week so we were thrilled to be able to spend it in this amazing cabin, the Catalina retreat will always have a special place in our hearts and we would love to continue to stay there whenever we return to Big Bear to always remind us of the last weekend we got to spend with our very best friend. *”We are all thankful for this wonderful cabin! WE have had an amazing time! And look forward to visiting again! *”This cabin is super…I had a very splendid time. The locals are very helpful and respectful. *We had the BEST time here! Our kids had so much fun playing in the snow. We look forward to coming back next year! It is a little cooler in Big Bear Lake this week and still beautiful as always. Now is the time to take advantage of lower, off-season rates and enjoy the added benefit of no crowds. 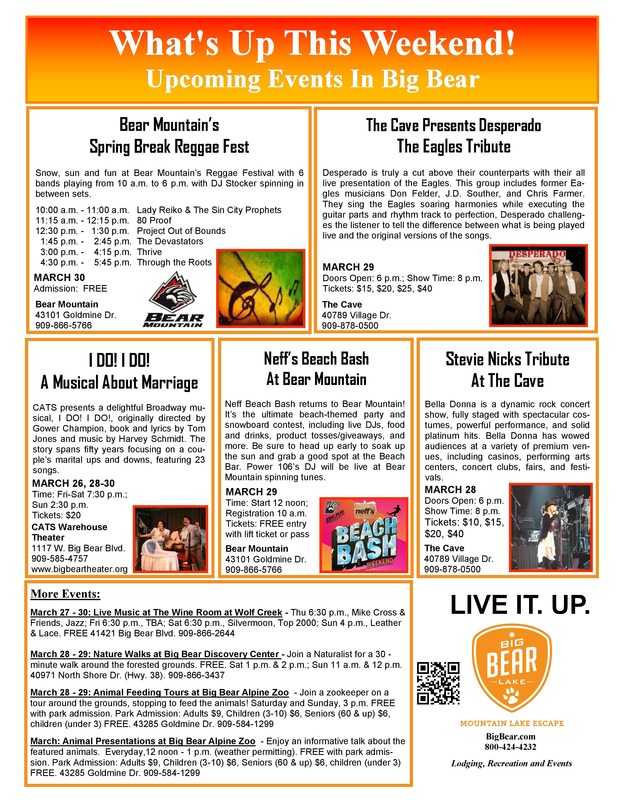 This weekend you can enjoy a variety of music and theatrical entertainment, take a stroll through The Village or enjoy one of dozens of activities. Happy First Day of Spring! 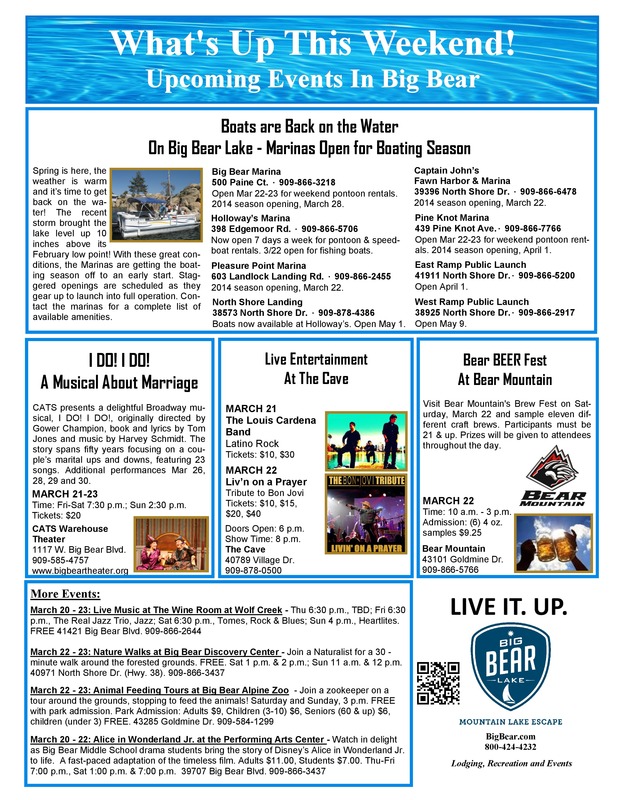 We are currently experiencing perfect, spring weather in Big Bear Lake, with more in store for the coming week. Bear Mountain Ski Resort is still open as well as the Snow Play Areas for those of you that would like to have a little more winter fun this season. For the rest, the lake is gearing to open and the temps are perfect for a hike or bike ride. Come on up!! 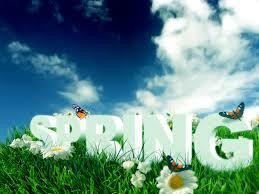 At RS Vacations, we have some great spring deals going on in addition to our lower, spring rates. 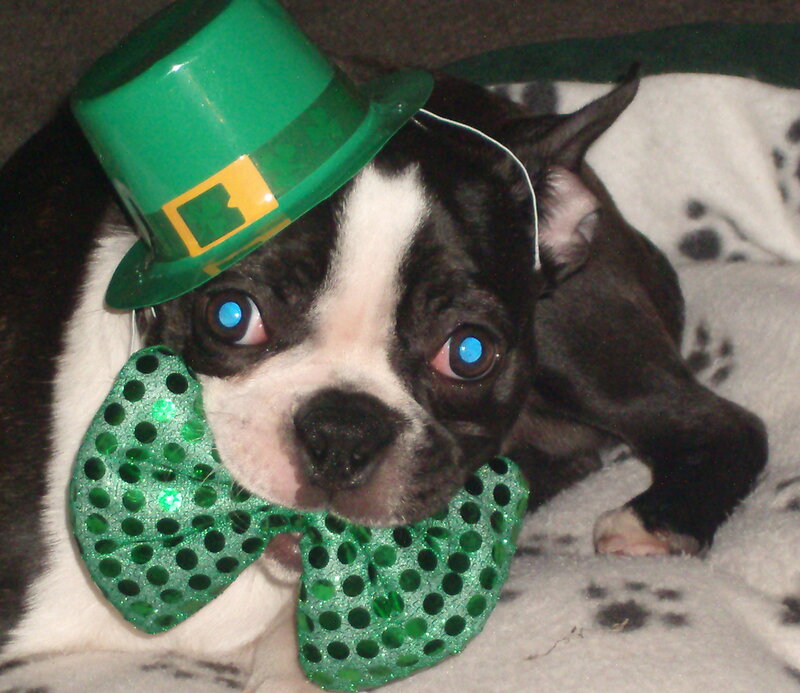 Check out the specials as well as our current activity packages here. Book a Big Bear Vacation Package today!! Elegant but Comfy 3 Bedroom Plus Sleeping Loft Home in Prime Location with Spa, Pool Table, Gourmet Kitchen and More…. Come and bring your family or friends up and enjoy this absolutely beautiful house that has it all! Bear Peek Inn is just STEPS from Bear Mountain Ski/Snowboard Resort and across from the Alpine Zoo (open year round with weather permitting). Enter the front door of this mountain retreat and take in the huge living room with Grand Piano (Mathushek) for the budding and experienced musician, TV, DVD, Surround Sound, WIFI, and a queen sleeper sofa. The chefs in your group will LOVE the gourmet kitchen with ample counter seating and appliances to cook up a gourmet mountain meal enjoyed by all. The dining room has seating for 12 with a table that converts, Voila!, to a full size pool table/poker table. The private upstairs master suite has a comfy king with twin sleeper sofa, sitting area, desk, private bath with shower/tub and TV/DVD/VCR. The spacious upstairs guest bedrooms have a queen bed each with TV’s. Guest bedroom one also has a single sleep sofa which is perfect for the kids. The large loft which overlooks the dining area with its magnificent windows to the backyard, provides an excellent “4th bedroom” with a queen sleep sofa, two closets, and TV. There are 2 additional bathrooms with showers upstairs so no one has to wait in line! For your convenience, there is another 1/2 bath and washer and dryer in the laundry room which are both just past the kitchen. The 2 car garage is adjacent and ready for guest use. Additional parking for 2 cars in the driveway. Walk outside on the expansive decking and enjoy the sounds of the forest and the zoo animals just across the way. The kids will love it! Coming back to civilization and ready to be pampered, enjoy a relaxing soak in the spa located in the open air conservatory just off the master suite. A Charcoal BBQ is provided for your grilling pleasure on the deck. View more photos, check availability and book Bear Peek online at RSVacations.net today and treat yourself to a Fun, Family Big Bear Lake Vacation. *We had a great time and thank you for providing an awesome experience! *We have never seen so much snow! The soft powder was perfect for teaching our little ones to ski. The cabin’s location is prime. We watched the buffalo and deer from the stairs and living room, and we walked to the ski resort. No other house has accommodated the 11 in our family so well. 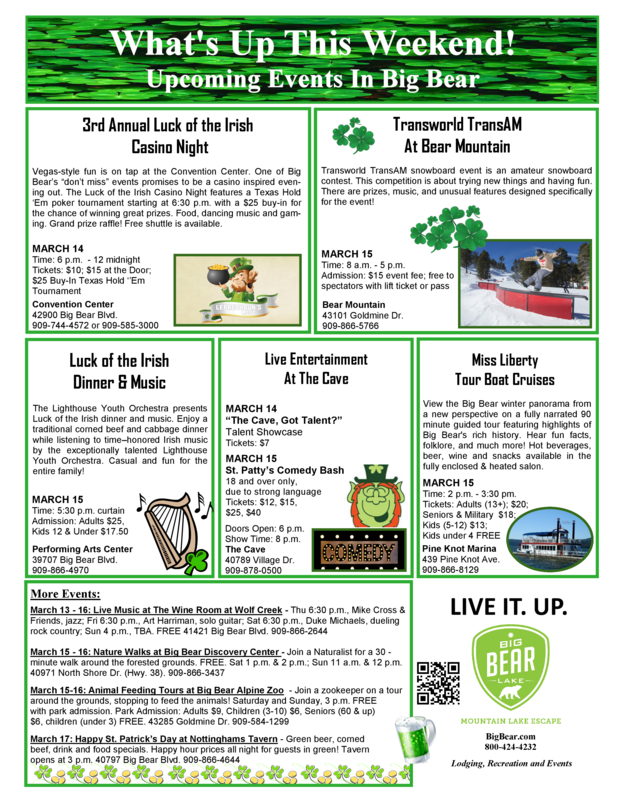 Yes, I know that St. Patrick’s Day isn’t for a few more days, but we do have a few St. Patty’s themed events happening this weekend here in Big Bear, so I thought I’d get into the fun! The weather has been absolutely beautiful the last week with daytime temps in the 50’s and lots of sunshine. Pleasant temperatures continue with a slight warmup for the weekend and early next week. 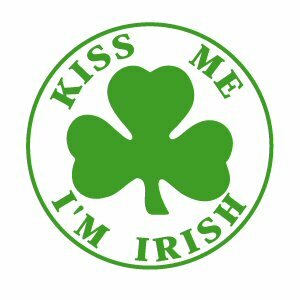 This weekend features an Irish themed Casino Night, an Amateur Snowboarding event, a Youth Orchestra Performance, a St. Patty’s Comedy Bash and more. Check out the flyer below for more information. Be sure to head over to our website and check out our specials page for a spring deal on our great selection of cabins. We are offering 3 nights for the price of 2 on top of our already reduced springtime rates. 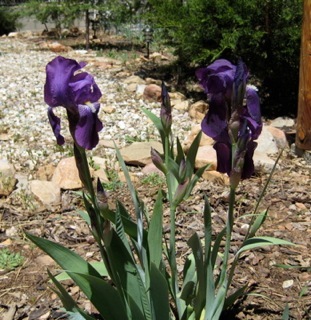 Spring is a wonderful time to visit Big Bear – the crowds are gone, the weather is lovely and rates are low. Book a Big Bear Cabin today!! STAY 3 nights at one of our selected homes and SAVE 33% (get the 3rd night FREE). OFFER CANNOT BE USED WITH OTHER DISCOUNTS OFFERED BY RS VACATIONS. OFFER GOOD FOR STAYS BETWEEN APRIL 1 AND MAY 22, 2014. Weekdays AND Weekends included in special.